The imprisonment of the former president is a tragic commentary on Maldivian democracy. Nowhere in her remarks did she describe the reality of the Maldives today. She failed to note that her uncle is president, that her father Maumoon Gayoom was the country’s dictator for 30 years, and that her government came to power after a military coup and stolen elections orchestrated by her family. Beyond this inconvenient truth, the leaders of all the opposition political parties have been imprisoned, arrested, or given mammoth tax bills to silence their criticism. Critics within President Abdulla Yameen’s party, such his defense minister, have been sacked and imprisoned. Even the chief justice of the Supreme Court was removed. The Government has cracked down repeatedly on non-violent protestors with tear gas, beatings, pepper spray, and mass arrests. The regime-controlled parliament has adopted an illegal law banning prisoners from being members of political parties. It is even now considering a new constitutional amendment to change the age requirements for the presidency to disqualify Gayoom from eligibility. And the Supreme Court, which now dances to the president’s tune, recently declared a report by the independent Maldives National Human Rights Commission’s to the UN Human Rights Council to be treasonous and unlawful. The Court placed new restrictions described by the UN High Commissioner on Human Rights as “designed to severely undermine [the Human Rights Commission]’s ability to engage with the UN human rights system.” The “independent” commission is now being stacked with Yameen-party apparatchiks. It truly is a tale of two Maldives. Perhaps the most obvious and tragic commentary on the rapid decline of Maldivian democracy is that the country’s renowned former president remains imprisoned. In 2008, the island nation elected Mohamed Nasheed in the country’s first free and fair elections. A popular and charismatic leader, Nasheed introduced democratic principles to the Maldives and sounded the alarm on global climate change, calling for international collaboration on the issue. Nasheed’s story is chronicled in the award-winning documentary, The Island President. Now, seven years later, “the Island President” languishes in a maximum security jail cell in Maafushi Prison (with a brief few-day reprieve under house arrest for medical treatment). Nasheed was sentenced to 13 years imprisonment for the crime of “terrorism” following a politically motivated and Kafkaesque trial. Nasheed has a long history of standing up the Maldives’ repressive regime, formerly under longtime dictator Gayoom – who served for three decades from 1978 to 2008 – and currently under Abdulla Yameen – Gayoom’s half brother who was installed in office in a rigged election in 2013. A thorn in the side of the former and current regimes, Nasheed initially made a name for himself as a dissident journalist. Over a 15-year period, Nasheed was arrested more 10 times. He was twice named a prisoner of conscience by Amnesty International. In 2003, Nasheed founded the opposition Maldivian Democratic Party. Just five years later, he was elected president in the country’s first multiparty elections, on a platform of democratic and human-rights principles. However, his presidency was abruptly cut short in February 2012 when he was forced to resign at gunpoint. Then, the following year, Nasheed attempted to retake the presidency through the electoral process, but his attempt was derailed when the Supreme Court of the Maldives annulled his victory in the first round, and postponed voting several times to ensure a win for Yameen. In January 2015, Yameen’s government had a new reason to crack down on Nasheed: Gasim Ibrahim, who had placed third in the 2013 presidential election, threw his support behind Nasheed and the MDP in the opposition. In the first round of the 2013 election, which had been annulled, Nasheed had 45 percent of the vote, with Yameen having 25 percent and Ibrahim 24 percent. It was only through that result being annulled, Ibrahim throwing his support to Yameen, and then the new vote being postponed several times that Yameen had won. With the new support from Gasim, Nasheed and the MDP would have more than enough support to win the 2018 presidential elections. 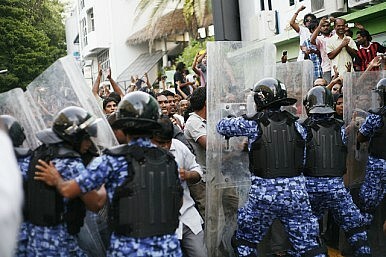 In light of this threat, the government had to take down Nasheed. So the government came up with fake “terrorism” charges based on the 2012 arrest of a corrupt Maldivian judge, when Nasheed was still president. Three years later, the judge’s arrest was twisted by the government into a terrorist “abduction” despite there being no evidence Nasheed had known about the arrest in advance or ordered it. In a true mockery of justice, in February of this year the Court convicted Nasheed and sentenced him to a crushing 13-year sentence. In the wake of Nasheed’s politically motivated trial and detention, the government of the Maldives is doing everything in its power to crack down on all political dissent in the country. All leaders of the political opposition to the regime are either in jail or awaiting trial on the same trumped up “terrorism” charges under which Nasheed was convicted. In April, Nasheed’s pro bono legal team – which I am honored to be a part of along with Amal Clooney and Ben Emmerson – filed a petition to the UN Working Group on Arbitrary Detention urging it to declare that his detention is arbitrary and in violation of international law. Nasheed’s case has been widely condemned by the international community. Amnesty International called the case a “travesty of justice” and the UN High Commissioner for Human Rights Zeid Ra’ad Al Hussein characterized it as “hasty and apparently unfair.” The UN Special Rapporteur on the independence of judges and lawyers noted “serious due process violations,” which led her to believe “the outcome of the trial may have been pre-determined.” The European Parliament in April adopted a resolution condemning the “serious irregularities of Nasheed’s trial,” while U.S. Secretary of State John Kerry said during a visit to Sri Lanka that Nasheed was “imprisoned without due process.” Last week, U.S. Senators John McCain and Jack Reed urged the U.S. Government to press for the release of all political prisoners in the Maldives. In May, Foreign Minster Dunya Maumoon was forced to address these critiques about Nasheed’s case and the broader political and human-rights situation in her country voiced by UN member states during the Maldives’ Universal Periodic Review. The only solution here is for Yameen to commute Nasheed’s sentence and let him go. Under Maldivian law, the President “has the discretion” on his “own initiative” to commute the sentence of a person convicted of a criminal offense for humanitarian reasons or because of their circumstance. There is little doubt that Yameen is deeply afraid of Mohamed Nasheed, who is only growing more popular as he languishes in his island prison. But until Yameen relents and justice prevails, the voices inside and outside the Maldives demanding the release of Nasheed and the restoration of democracy to this wonderful island nation will grow louder and more powerful. President Yameen, free President Nasheed. Jared Genser is founder of Freedom Now, pro bono counsel to President Mohamed Nasheed, and a columnist with The Diplomat. Commonwealth Withdrawal Highlights Challenges in MaldivesState of Emergency in the Maldives Ahead of Opposition ProtestsA Bleak Outlook for Democracy in the MaldivesThe Maldives’ Games of ThronesParadise in Turmoil: What's Next for the Maldives?